When the Ducks hired Andy Avalos as defensive coordinator, there was suddenly an opening for a STUD. The STUD position in Avalos’s scheme is a hybrid edge defender/outside linebacker, a guy who can rush the passer, stuff a run block or turn and run with a tight end up the seam. Avalos’s STUDs at Boise State measured 6’3″ 266 and 6’4″ 238 for an average of 6’3 1/2″ 252 pounds. Compare that to Brian Urlacher, who came into the 2000 NFL combine at 6’3 3/4″ and 258 pounds, and ran a 4.59 40. 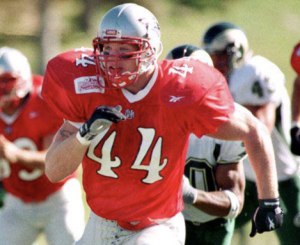 Urlacher turned into a very good inside linebacker for the Bears, but to this author, his measurables — as well as his experience as a safety, wide receiver and punt returner at New Mexico — suggested a prototypical STUD. There’s no doubt Brian Urlacher fit the STUD mold. As most of us (ahem) have realized, not everyone can be a stud, let alone the STUD. Mario Cristobal has proffered a gaggle of candidates for the position of inaugural Duck STUD, including La’Mar Winston (6’3″ 220), Adrian Jackson (6’2″ 218), DJ Johnson (6’5″ 255) and Kayvon Thibadeaux (6’5″ 240). The first two strike me as OLB’s who might be able to hold their ground on the line, while the latter two are DE’s who might be able to run with a back or tight end. Troy Dye with the Redbox Trophy. 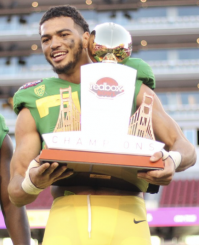 Allow me to nominate another candidate in Troy Dye (6’4″ 225). 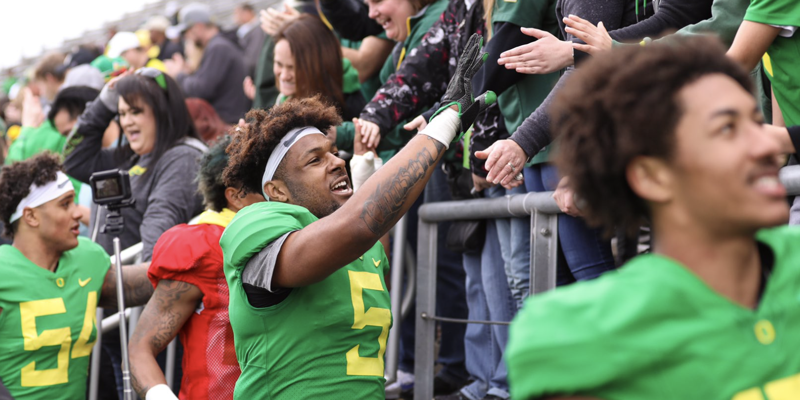 Dye played safety in high school, lit the world on fire as a freshman outside ‘backer in Brady Hoke‘s 4-3 scheme and moved inside in Jim Leavitt‘s 3-4. I have seen Dye stick with slot receivers that have caused our corners trouble. Sure, I would like to see him put on 20 pounds, but I would also like to see Jadeveon Clowney with Tyreek Hill’s quickness. Moving Dye outside would open up playing time on the inside for more traditionally stout guys like Mase Funa (6’2″ 245). Perhaps due to the conjuring of Brady Hoke, I do profess some concern for the Avalos system. Hoke’s system failed miserably, probably in large part due to the lack of size at defensive end. Might a hybrid STUD expose a similar vulnerability against the run? Let’s watch for the candidates in the spring game and particularly whether or not the STUD can hold up to the running game. Do you have any concerns with Avalos’s scheme?